In the early morning, we will transfer to Taipei Airport and fly to Xiamen, also known as Amoy, a beautiful, coastal city in southeastern China. After lunch, we will visit South Putuo Temple which was built during the Tang dynasty and is a famous ancient temple in Xiamen. Tonight, we will enjoy a Local Seafood Meal using only fresh ingredients from the sea. 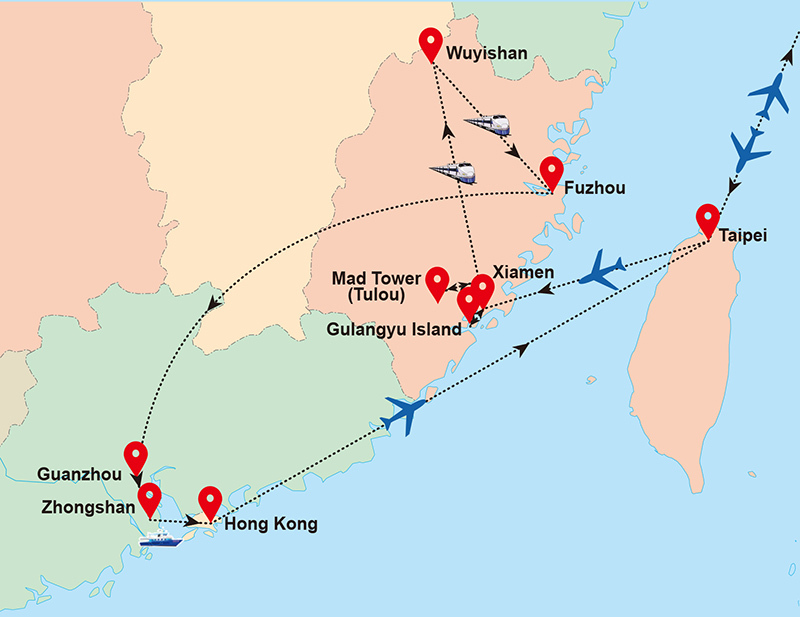 The location of Xiamen on the southeast coast of China provides it with abundant sea products. Dating from the Qing Dynasty, the local seafood is always a traditional delicacy made from fresh items such as fish, prawns, and shrimp with the flavor depending on the various seasonings. Today we will explore Gulangyu Islet by ferry. Villas and mansions on the islet are ornate and add much charm to the satellite island. We will make a stop at Guanfu Museum & Piano Museum to take a look at their antique collections. Shuzhuang Garden is an embodiment of three important principles of garden design – hiding elements, profiting from the natural surroundings and combining movements. After lunch, we will visit Hi Heaven Villa (or Sea & Sky Villa) built by Philippine Chinese Huang Xiuhuoliang. After enjoying the Traditional Puppet show and Ancient Nanyin Music Concert, we will return to Xiamen. 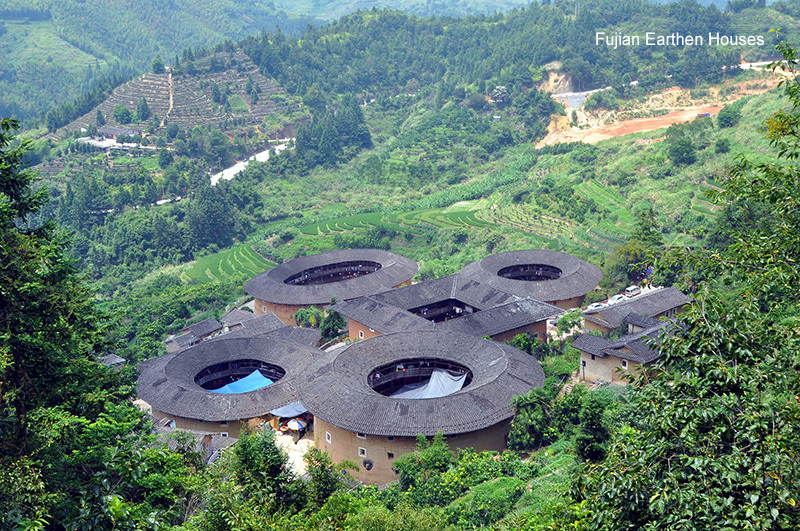 After breakfast, we will drive to visit the new UNESCO World Cultural Heritage Site – Fujian Earthen Houses (Tulou). Over twenty thousand of these houses still stand today; ten of them are over 600 years old. As most Hakka resided in mountains, communal houses were made of compacted earth to provide protection against bandits and wild animals. The older examples of this style of construction consist of interior buildings enclosed by huge peripheral ones holding hundreds of rooms for dwellers. First, we will visit the Tianluokeng Earthen Building Cluster, inhabited by hundreds of Hakka people. It is a national protected cultural site with the most magnificent and well-preserved Hakka Castles in the area. Consisting of one rectangular earthen house (Buyunlou) in the center and three round ones (Hechanglou, Zhenchanglou and Ruiyunlou) and the oval one (Wenchanglou) around them, Tianluokeng Tulou, is a characteristic classical castle among the eight most famous types of Tulou, attracting millions of visitors from home and abroad. The castle is nicknamed “four dishes with one soup” by locals, and its five houses are all three-storied buildings with 22 to 32 rooms in each one. The rectangular earthen house (Buyunlou) is the oldest one (built in 1796 in the Qing Dynasty) with four stairways, expressing the founder’s wish that his descendants could get promotions step by step. Hechanglou was built just several years after Buyunlou, Zhenchanglou and Ruiyunlou were built in 1930’s, and the latest building Wenchanglou was built in 1966. Built for a tilt-shaped mountain, these exquisite earthen buildings compose a marvelous scene with nature, and provide a powerful visual shock to visitors. Today’s lunch features Local Hakka Cuisine. Hakka cuisine occupies an important place in Chinese cuisine with its unique flavor. Hakka dishes taste “fat, salty, and ripe”. Traditional Hakka signature dishes include: braised pork with preserved vegetables, salt baked chicken, stuffed tofu, pork tripe, stewed chicken, stuffed bitter melon, steamed taro bun, taro dumpling, and stewed duck in three cups of sauces. Today we will take the High Speed Train to Wuyishan, in the north-western part of Fujian Province and is the most scenic mountain in Southeast China. Cut off from the outer mountains, Wuyishan is surrounded by streams and valleys. 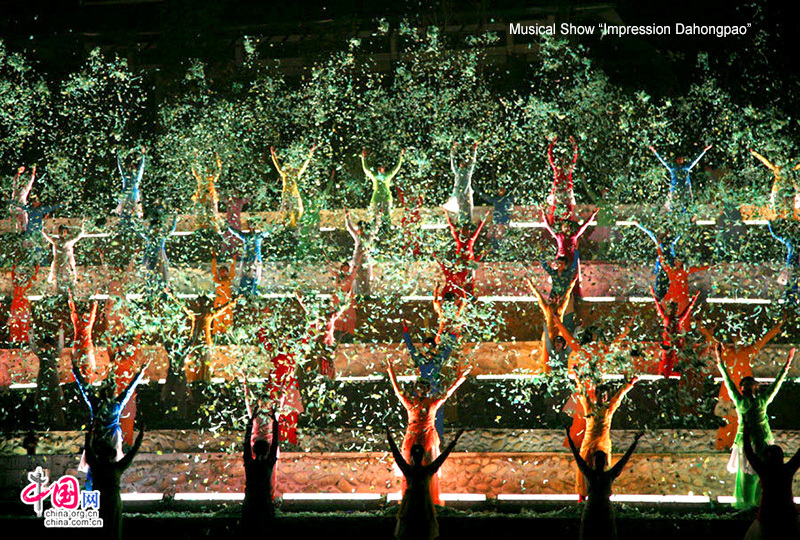 Tonight, an Outdoor Musical Show “Impression Dahongpao” will be arranged. Impression Dahongpao is an unprecedented “matrix type” movie, integrating 15 movie screens into the natural landscape, forming the “matrix type” wide real movie scenes to create the effect of a dream-like scene. The outdoor theater is the World’s biggest and the first to introduce a 360 degree rotating auditorium, presenting the one and only “Rotating View Theatre”. Today’s highlight is the World Natural Heritage – Wuyishan National Park. We will explore Tianyou Peak, which is surrounded by the Nine-bend Stream on three sides. From the top of Tianyou Peak you will have a panoramic view of Mt. Wuyishan and the sea of clouds after rain or at dawn. Wuyi Palace now preserves two Dragon wells, Wannian Palace and Sanqing Hall. Wannian Palace serves as the memorial hall of Zhu Xi Memorial Hall. The Song Dynasty Street is 300-meters long and starts from the Memorial Hall of Zhu Xi. The most exciting part of today will be the Jiuquxi River Rafting. Jiuquxi River is praised as the “Soul of Mt. 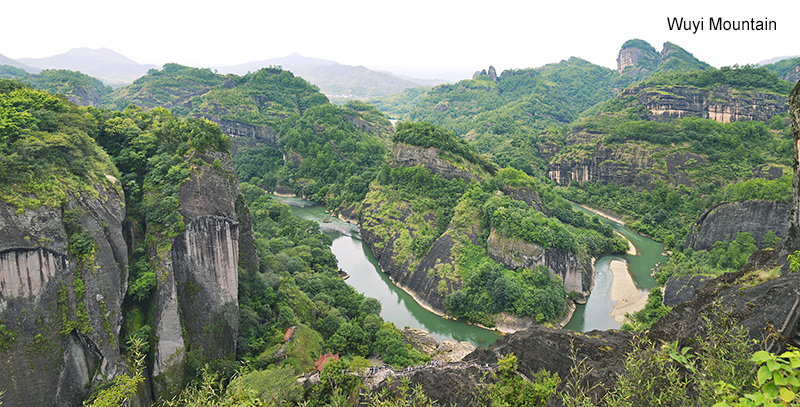 Wuyishan Scenic Area” and is famous for natural sceneries of mountain and water along the river. To appreciate the beautiful scenery of Jiuquxi River, the best choice is to take a bamboo raft, made of eight or nine bamboo rods. This river crossing tool has a history of thousand years and features a shallow body with lighter buoyancy. After breakfast, we will transfer to Fuzhou by High Speed Train. Fuzhou, a city in south China across the strait from Taiwan, is famous for its sea views, mountains and historical sites. As the capital and one of the largest cities in Fujian Province, Fuzhou is also known as the “city of banyans”, because of the numerous banyan trees planted there. Upon our arrival, we will check into our hotel and explore the city on our own. Fuzhou may not be as popular as the top Chinese tourist cities like Beijing, Shanghai and Hangzhou, but it is an ideal tourist destination with mild weather and graceful natural scenery. It features spectacular forest parks, unique gardens, historic temples, ancient-style architecture and old streets. 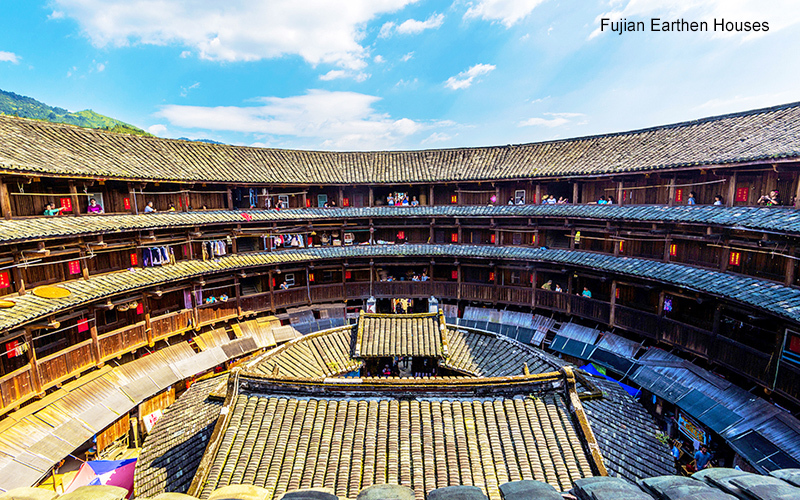 Located in the downtown area of Fuzhou, the Three Lanes and Seven Alleys (Sanfang-Qixiang) is a district of streets featuring a cluster of ancient residential buildings and is the largest well-preserved historical heritage site in China, referred to as the ‘Architecture Museum’. We will visit the house of Lin Zexu, a Chinese hero who fought against opium and led the first Opium War by burning opium at Humen Beach in 1839. After lunch, we will continue our tour to The Mawei Shipping Culture scenic area, recognized as a National 4A Scenic Spot in 2011. Mawei Shipyard Museum is an exhibition hall presenting the history of ship-building and navigation culture that featured ship building, ship repairing and talent training. Majianghaizhan Memorial Hall (also called Zhaozhong Memorial Hall) is a temple constructed in memory of the martyrs who sacrificed their life during a sea war between China and France and completed in 1886. Pagoda Anchorage (Luoxing Pagoda), Mawei’s great landmark, is the Southern Song Dynasty Luoxing (Falling Star) Pagoda. It has been a mariner’s landmark for centuries, and even the great explorer Zhenghe drew it into the Mawei sculpture of Sino French Battle of Fuzhou in 1884 as his navigational charts. During the Ming Dynasty, Europeans gave Luoxing the highly imaginative English name of “China Pagoda”. Today, we will take a short flight to Guangzhou and then transfer to Honolulu’s Sister City – Zhongshan, the birthplace of Dr. Sun Yat-sen (also known as Dr. Sun Zhongshan). Dr. Sun Yat-sen was the first president and founding father of the Republic of China. Upon our arrival, please enjoy your leisure on your own. After breakfast, we will visit Zhan’s Garden, known as Zhongshan Grand Mansion or Zhongshan Da Zhai Men (a large old-style house), the largest private classical-style garden in southern China. Zhan’s Garden, designed by owner Huang Yuanxin and built by hundreds of skilled craftsmen in gardening from all over the country, covers about one hectare (2.5 acres) and took 5 years to complete in 1998. The art of classical-style gardens has a long history in China dating back to the Pi Jiang Garden in Dongjin Dynasty (4th Century AD). Compared to the massive and magnificent royal gardens in the Beijing area, this private garden is famous for its delicate, gentle and free style. After lunch, we will return to our hotel and explore the beautiful city on your own. Today, we will take a ferry to Hong Kong. Upon our arrival, we will check-in to our hotel and enjoy the rest of the day. Today, please feel free to enjoy a relaxing day. You can visit old friends or explore the charming city on your own. Today, enjoy a free leisure time on your own in the morning. In the afternoon, we will transfer to the airport for our return flight home via Taipei, ending our fantastic tour in China and Hong Kong Extension. CHECK OR CASH PAYMENT ONLY. A deposit of $350 per person is required at the time of application. The balance is due 70 Days Prior To Departure. In the event payment balance is not made within the required time period, Air and Sea Travel Center reserves the right to cancel reservations and charge a cancellation fee. Written notice is required for any cancellation. $350 deposit is non-refundable if you cancel within 70 days before departure. ** 30 days prior to departure or withdrawing during the tour shall be regarded as willingly giving up all rights concerned, 100% of total price, and request for other services as a substitute shall not be accepted. We strongly recommend purchasing travel insurance when you make a reservation.